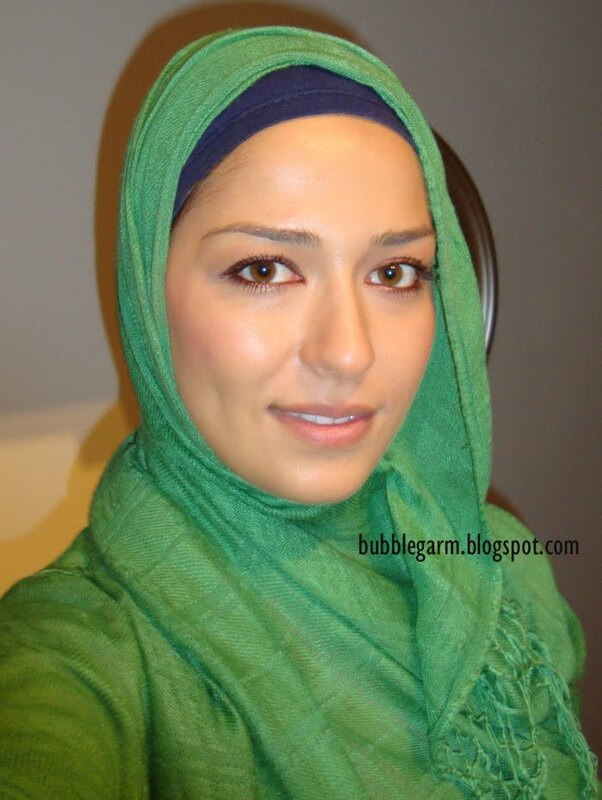 As promised, here's a Hijab look. This is what I wore to go to the mosque this evening. I kept it VERY natural, I really don't think over the top makeup is suitable with a hijab unless it's for a very special occasion particularly during the month of Ramadan. CHEEKS: Chanel bronze universel very lightly & a light dusting of Mac Dollymix. EYES: Garnier tinted eye roll on concealer, Urban Decay Lucky 24/7 pencil on waterline and upper lashline, L'oreal Voluminous mascara. I love how 'Lucky' looks with my eyes, it looks effortless yet interesting. The perfect bronze eyeliner! Here's my outfit, my camera doesn't like to focus sometimes *sigh*. I wore jeans with a standard top and a long baggy cardigan with brown buttons. I saw so many people wearing the hijab in all different ways, it's all very inspiring. I usually wear mine the way I do in the picture but some of the styles I have see are so cute! How do you wear your hijab? And, for the non Muslims... what styles do you like or dislike? I personally love colour, but not too in your face and not too matchy matchy! Love what you did with the eyes and the green is such a pretty color on you. Your make-up is beautiful and what gorgeous eyes you have...love it! Love this look. Your eye makeup looks very natural and pretty. I would love to see more posts related to your culture/religion, it's very interesting and it gives us a way to get to know you better! You look stunning in green and the makeup was perfect. Thanks for sharing! I love hijab on you! You look so incredibly gorgeous:-) mashallah! !Hijab definetly does not have to boring and can be chic! I love the way you styled it! Thanks for this post Muhsine!! your skin looks so fresh and flawless and you look great in a hijab. Just beautiful!! hun, you look gorgeous with the hijaab on! masha'Allah..
May Allah S.W.T aid us and guide us to the truth. Ameen. You look lovely in a hijab, mA :) I usually just use the dupatta (scarf) that comes along with the shalwar kameez as hijab. Love that your makeup, though subtle, just accentuated your eyes. Beautiful! you are beaufitul maa sha Allah. i love the way you wrapped your scarf, when it comes to my hijab--i like it simple, comfortable and as loose as it can be. my goodness, your skin is flawless! i'm not muslim, but i've seen a few women wearing hijab's here and there but they're mostly neutral. i love how you wore a bright colour but it's not distracting at all. you are so gorgeous mashallah! gorgeous! u have beautiful eyes! I like when people put jewellery on the forehead or some random clips at the back. I immediately spotted that liner from the first photo, it looks great on you, definitely brings out your eyes!!! you look adorable honestly it took me a minute to work out it was you but wow! I love pure, ethereal glow on face and the slightly exotic tinge on the eyes. I'm sure it's really helpful for the hijab-wearing readers. I'm not religious myself but I have many friends who cover their heads, so I had the chance to closely examine what beauty looks work with hijab, and the conclusion I reached is that it goes the best with naturally emphasized eyes, just like your look here. it looks innocent as it should be in a hijab look, yet defined enough. strong lips just don't work. Omygoodness your hijab looks amazinggggg on you! The green is beautiful and makes your skin look amazing! I like how you chose to opt out of lipstick with your hijab. I don't know why, but lipstick is so showy against the hijab and it can look inapproapriate. Great post! oh, also, I think a lot of people don't appreciate the beauty of women in hijab, and underestimate us when it comes to style and beauty. This post is so great for helping us hijabis break those stereotypes. Thank you! MashAllah, you look so lovely. I really like the way you have put your outfit together as well. It seems very neat, classy but still within the Islamic codes. Thank you for sharing this look with us! Early Eid Mubarak. May I request all the readers to plese pray for our brothers and sisters in Pakistan. I love the green you've chosen for your hijab! YOU LOOK GORGEOUS AS ALWAYS! usually I wear mine in black or white i only wish i could venture out to a pink or purple. when i went to morocco i liked the way they styled the hijabs I attempted to do it this way but sadly mine fell apart after 5 mins. So back to the usual. I wrap my head scarf exactly as you have in your photo. I too do not normally like matchy matchy! (you can see my hijab style on my fashion blog: www.lovemyhijab.blogspot.com). İyi bayramlar o zaman sana. Hi Muhsine...Love your look and your eyes are just fabulous!! i wear a long-tonik on jeans , or any blouse on long fully open skirt "such as cash maillot" :)under a pair of white linen.. wow!! thats all i can say! mashallah youre gorgeous, ur husband is a lucky man!! That's cute!I remember myself wearing it like that when I was sixteen (subhanAllah I'm twenty now and I think that time is running too fast!) and a full of memories came across my mind by watching your photo! I also remembered how I was so excited about going out with it My God it's a sweet sensation of faith through your soul and your body. Now I'm wearing jilbab el hamdulillah and that's really great!I do live in France and when I see how they treat us I wish I could fly to an other country whatever where but where people are accepting hijab without shouting that we're not really true women because we're wearing a scarf to cover our hair. I'm just happy that Allah gave us the privilege to recognize His words while listening Qur'an. I really like your hijab on you! Can you do more plz! you look pure..just i love it..
you look pure..just i love it. MashALLAH you look elegant in Hijaab.